India secures the top position in the production of tea after China. Tea found in India is categorized into 3 types namely Assam tea (highest cultivation), Darjeeling tea (Superior quality tea) and Nilgiri tea (subtle and gentle flavours). Tea packaging depends on the quality of tea to the type of consumer of tea. Gourmet tea manufacturing requires varied design, material and colour as compared to tea manufactured for the masses. The trend of packaging different flavour tea in different coloured tea bags helps not only in differentiating but also attracts the consumer attention. There is a growing trend of using sustainable tea packaging, which will reduce the health issues and the recyclability of the material will also save the trees and other valuable resources. There is a growing demand of sustainable packaging not only from the environmentalists but also the tea consumers. In 2016, India produced 1,267.36 million kg of tea, all being available for packaging in one or the other forms. Major tea production regions, Assam and Darjeeling, are undergoing through the border stress that negatively impacts the tea industry. Further, India has experienced the declining trend in the tea industry in 2017, majorly due to the government policies such as GST and Demonetization, but in the coming years from 2018, the tea industry is expected to emerge and flourish. Goldstein Research analyst forecast that the India tea packaging market is set to reach USD 3.2 billion by 2025, growing at a CAGR of 5.3% over the forecast period (2017-2025). Tea Bags accounted for largest market share of 32.9% in 2017. Over the forecast period tea bags is expected to continue its market share on the back of its growing demand for its easy application. Geographically, North Eastern region accounted for the largest market share of 61.3% in 2017 on the back of major producing region of tea and it is closely followed by Southern India, based on the second tea producing region, which encompasses major packaging industries. The report covers the present ground scenario and the future growth prospects of the tea packaging market for 2017-2025 along with the market players’ analysis. We calculated the market size and revenue share on the basis of revenue generated from major players in the India region. India tea packaging market is forecasted on the basis of tea packaging production supply and agricultural produce. India tea packaging Market Outlook 2017-2025, has been prepared based on an in-depth market analysis from industry experts. 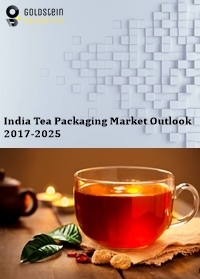 The report covers the competitive landscape and current position of major players in the India tea packaging market space. The report also includes Porter's five force model, SWOT analysis, company profiling, business strategies of market players and their business models. “India Tea Packaging Market Report” also recognizes value chain analysis to understand the cost differentiation, pricing models to provide a competitive advantage to the existing and new entry players. Our India tea packaging market report comprises of the following companies as the key players: Tata Global Beverages, Gujarat Tea Processors & Packers, Hindustan Unilever Limited, Associated British Foods and Duncans Industries Ltd.